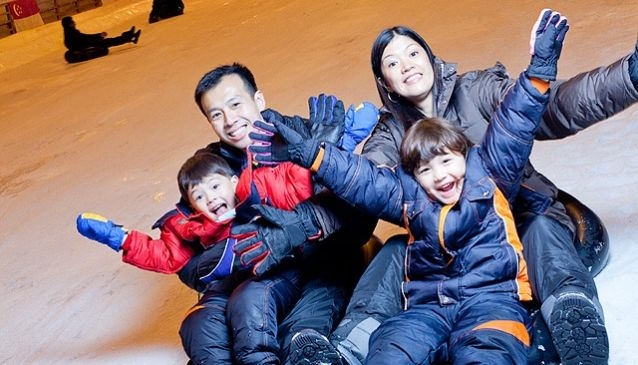 Snow City, located in the western part of Singapore, near Singapore Science Centre, is this fun attraction for families. Revamped in 2007, it is the place to go if you want to cool down and enjoy sub-zero temperatures of up to minus 10 deg Celsius. This indoor snow centre offers entertaining snow play all year round with a three-storey high and 60 meters long snow slope. Visitors will especially enjoy the tube ride down the slope. Since November 2012, they have added on even more fun with 25 ice -sculpted dinosaurs, housed in the Ice Gallery, including new educational programs for children. Snow City is popular with locals and the expat community who craves the occasional winter feeling from home. This is especially true around Christmas time when the centre gets more visitors. During holidays they offer special activities such as snow shows, snowman building and liquid nitrogen demonstrations. Snow City also serves as a venue for cooperate and team building events.